Forget Theresa May’s set-piece speech to the Conservative Party conference tomorrow. No one, not even the most loyal supporter, expects anything much of it, or of her. Given the utter disaster that was her conference speech last year, and so low is the bar she consequently has to clear, just getting to the end of it without major mishap will be success of a kind. No: today’s the day. The day when Boris supposedly comes clean, sets out his stall, and unashamedly makes his pitch to be both party leader and Prime Minister. The day when, in a Conservative Home event scheduled to last from 1pm until 2pm, he makes a speech clearly calculated to be the big event and talking-point of the conference, and upstage May’s predictably pedestrian-by-comparison effort tomorrow into the bargain. But the runes aren’t necessarily overwhelmingly favourable. Out in front of the pack with party members and activists he may be, but in the event that May is deposed, whenever and for whatever reason, he has to surmount the obstacle of a Parliamentary vote by Tory MPs to decide which two leadership candidates are placed before the membership. A majority of those 315 Tory MPs are determined that he won’t be one of them. Many purely because they are either closet or overt Remainers, who form a majority of Tory MPs anyway and would oppose any Brexiteer becoming Prime Minister, and others who, irrespective of their Brexit stance, harbour personal antipathy towards Boris for a variety of reasons, some arguably justified but others less so. So rather than tilting at an immovable windmill, a shrewd Boris should box clever and confound both expectations and his enemies by doing the completely unexpected. He should start by repeating the essence of his resignation speech, namely its forensic, entirely policy-focused criticisms of May’s Chequers Plan approach to Brexit, which were careful not to attack May personally, and its plea that it was not too late for a different, more robust approach more in tune with the desire expressed by British voters via the Referendum result for clear economic, judicial and political separation from the EU’s institution. Then note regretfully how this change of approach hasn’t happened, with not only the eminently foreseeable result of the EU’s peremptory rejection of Chequers despite even more concessions, but its accompaniment by the intransigent Eurocrats’ contemptuous and malevolent humiliation of May personally. Continue by expressing his sorrow at how, despite other and better Brexit plans being available, the Prime Minister has inexplicably persisted in sticking to her Chequers Plan despite its manifest flaws and unpopularity. He should then turn to the Conservatives’ non-Brexit difficulties. It’s deeply disturbing, he should say, that extreme-Left Corbyn socialism appears to have gained such a foothold among the electorate despite the abundance of evidence from everywhere it’s been tried that it doesn’t work; that the Tories are out-polling Labour by barely the statistical margin of error in polling; that the business presence at a hard-Left Labour Party conference was notable for its extent, and that anticipation of a Corbyn government is as high as it is. Note ruefully the present leadership’s seeming inability to come up with any significant counter to Corbyn’s apparent appeal by forcefully making the arguments for a smaller, less-activist state and freer markets, and by devising innovative supply-side solutions to the housing and elderly-care crises, instead resorting too readily either to negative scaremongering or watered-down versions of Corbyn’s own policies. Conclude, with infinite regret, that he’d come to the inescapable realisation that the current leadership was unlikely to reverse this trend so that, however reluctantly, he could see no other option than a change of helmsman. This is the point at which Boris should drop the bombshell that no one’s expecting. He should say that he’s aware of his own shortcomings: he accepts that his chaotic, even louche, private life is a turn-off for many; acknowledges he’s almost certainly temperamentally unsuited to the mundane attention to detail that the highest office demands; recognises his limited appeal among his MP colleagues – consequently he would not be a candidate. Follow this immediately by a declaration that he pledges himself to exploit such popularity as he does enjoy with the party’s grassroots and activists, and the wider public, to campaign up and down the country for a committed Brexiteer Prime Minister. 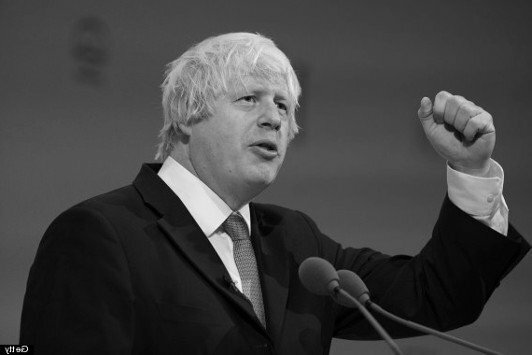 With this strategy, Boris would at a stroke destroy the main objection to a change of party leader and Prime Minister: that he seeks a change only as a vehicle for his own vaulting ambition. He would eliminate the obstacle of Tory MPs who, though they might be open to May’s replacement with a Brexiteer PM, wouldn’t support it if it meant Boris in Number Ten. He would negate the disadvantage of his own mercurial temperament by deploying it in a role for which it’s far more suited. That strategy, and speech, would throw May and her soft-Brexit acolytes, anticipating a straight-out leadership challenge from Boris, right off balance. It would provide a conference talking-point like no other. It might even ensure Boris a place in history as the statesman who secured Brexit by sacrificing his own ambition for the the cause.